Ohio companies can open new foreign markets for their products through three trade missions early next year. 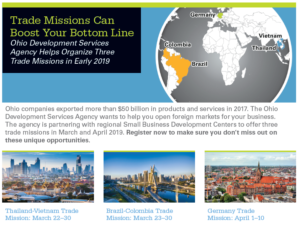 The Ohio Development Services Agency and the state’s Small Business Development Center Export Assistance Network is organizing the trade missions, scheduled for March and April 2019. Slots for each trade mission are limited, so businesses should act now to reserve a spot. Thailand-Vietnam from March 22-30: Target markets include, but are not limited to, industrial or electrical machinery and equipment, automotive parts and accessories, iron and steel products, optic and medical equipment, plastics products, chemicals, and hardwood lumber. The registration deadline is January 11, and the participation fee is $1,000. Brazil-Colombia from March 23-30: Target markets include, but are not limited to, construction equipment for public roads and airports, transportation services and mass transit systems. The registration deadline is January 22, and the participation fee is $1,500. Germany from April 1-10: Target markets include, but are not limited to, technology/med-tech, energy systems, innovative supply solutions, consulting, metalworking and instrumentation. The mission includes participation in the Hannover Messe. The registration deadline is Dec. 7, and the participation fee is $1,500. The fees include in-advance market research to help businesses prepare for the missions, one-on-one meetings with potential buyers, and logistical and translation assistance in each country.